The Content page shows available content and manages content on the HyperCaster. Use this page to see what content is currently available, to search for specific content, to import new content files, to create continuity playlists of video files, to create placeholders for content you don’t have yet, and to perform bulk actions on selected content such as deleting or categorizing. 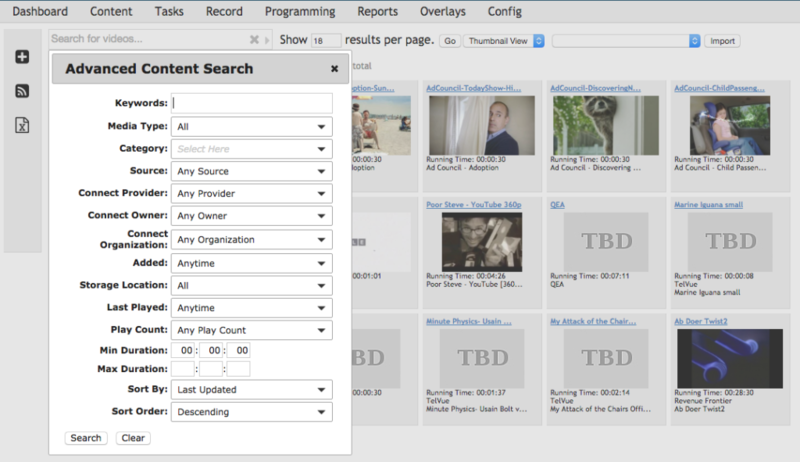 Search for videos by filename, keyword, description, category, media type, or source. Click on the right side of the search field to open the Advanced Content Search window. More on the Advanced Search option, here. Choose how many videos to display per page. Two views are available; the default thumbnail view and the table view. The Import function should only be needed to bring back content that has been “purged”. The total number of content files is displayed on the next line. The HyperCaster comes preloaded with sample MPEG-2 clips. For complete instructions on adding your own content, please refer to this page. Add TBD – Read this page for detailed instructions on adding a program that you may want to schedule, but don’t have yet. RSS – displays the imported content in RSS format. More on the RSS feature, here.